If interested in any of these Hawaii travel deals and vacation packages to Kauai, Maui, Hawaii and Oahu, please call 702.706.7272. Island fever getting to you? 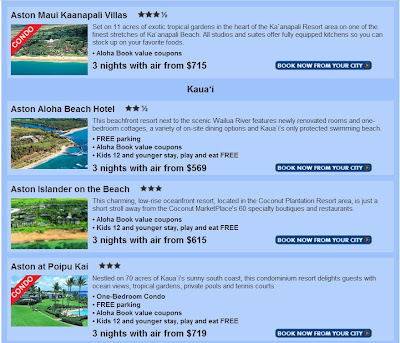 Travelele is now offering weekly travel deals to the most popular vacations destinations on the mainland. Call us at 702.706.7272 for more information about one of these featured travel deals. We can also create custom vacation packages to most vacation destinations around the world. The Madison Hotel , Washington D.C.
Includes roundtrip air from HNL, $50 discount per booking PLUS Kids 17 & younger stay FREE. 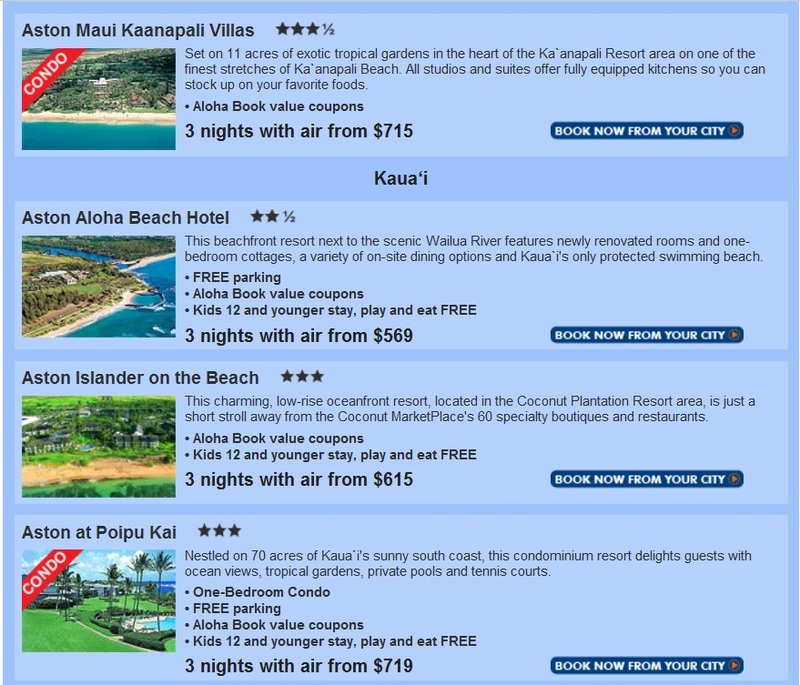 Includes roundtrip air from HNL, a $50 discount per booking PLUS Kids 16 & younger stay FREE. 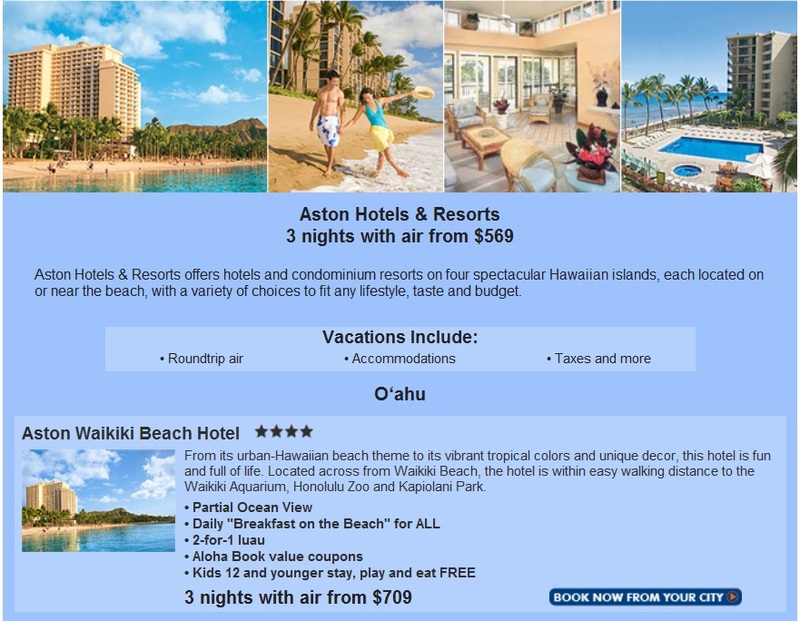 Includes roundtrip air from HNL, a $50 discount per booking, 4th night FREE, breakfast for two, welcome amenity, room upgrade PLUS Kids 11 & younger stay and eat FREE. Marco Island Marriott Beach Resort, Golf Club & Spa, Southwest Florida's Gulf Coast Includes roundtrip air from HNL, a $50 discount per booking, 4th night FREE PLUS Kids 18 & younger stay FREE. New York Marriott East Side, New York Includes roundtrip air from HNL, a $50 discount per booking PLUS Kids 17 & younger stay FREE. Orlando World Center Marriott, FloridaIncludes roundtrip air from HNL, a $50 discount per booking, 4th night FREE PLUS Kids 18 & younger stay FREE. Rancho Las Palmas Resort & Spa, Palm Springs Includes roundtrip air from HNL, a $50 discount per booking, 4th night FREE, two rounds of golf PLUS Kids 17 & younger stay FREE. Sheraton Fort Lauderdale Beach Hotel, Florida Includes roundtrip air from HNL, a $50 discount per booking and 3rd night FREE PLUS Kids 17 & younger stay FREE. The Edgewater Hotel, Seattle Includes roundtrip air from HNL, a $50 discount per booking PLUS Kids 17 & younger stay FREE. Includes roundtrip air from HNL, a $50 discount per booking and 3rd night FREE PLUS Kids 17 & younger stay FREE. Trump International Hotel, Las Vegas Includes roundtrip air from HNL, 2 nights in a Las Vegas Suite, kids 12 & younger stay FREE. Call Travelele at (702)706-7272 or email us with your vacation request, today.